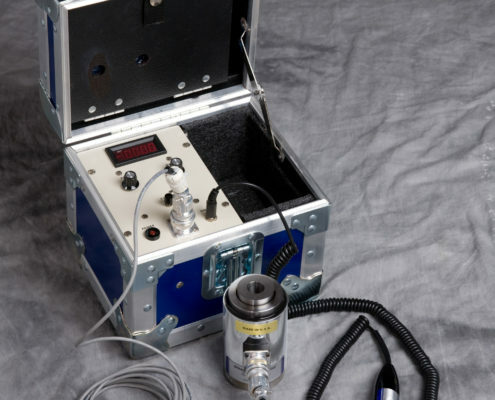 Pre-cast Concrete Load Cell Systems – Strainsense Enterprises Inc. 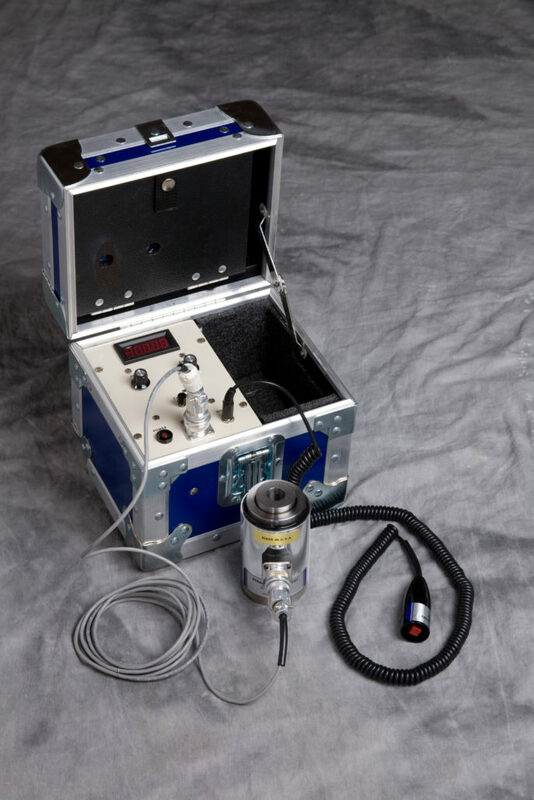 The Conamp 207B Digital readout system is specifically designed and manufactured as a self-contained, portable, load cell unit to accurately provide cable tension measurements required in the manufacturing process of pre-stressed/ pre-cast concrete. The Digital readout displays the actual load in pounds and features a remote “Hold” load control circuit. The system can accommodate one (1) or two (2) load cells (capacities offered: 40,000 lb, 50,000 lb, 60,000 lb, 75,000 lb, and 100,000 lb). 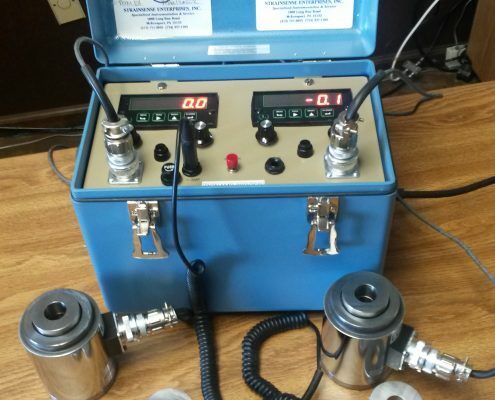 Strainsense can perform the annual ASTM E-4 calibration that is needed. The system is certified to the ASTM E-4 specification upon shipping. The load cell is a hollow compression canister type that is designed with ¾” through hole which allows the 0.5” or 0.6” cable to pass through (different diameter holes can be selected by customer). The load cell is designed with a swivel top assembly for uniform load distribution. The Conamp 207B system is supplied with a 10’ interconnecting cable, hold cable and operates using four (4) 9-VDC batteries. 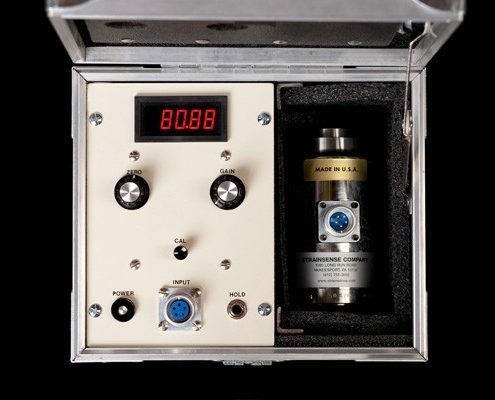 The system has a compact design with a fiberglass case that houses the digital readout, load cell, and cables. 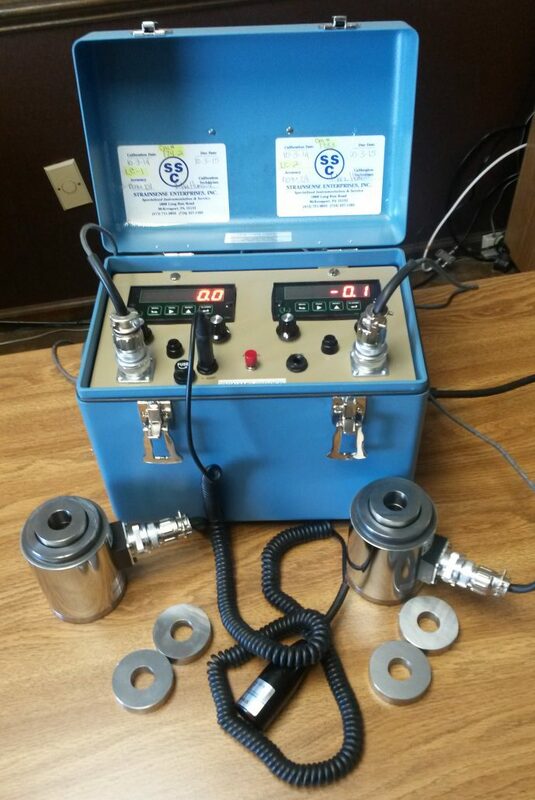 The complete load cell package is calibrated and meets the ASTM E-4 standard traceable to NIST and has the accuracy/linearity of +/-0.10 F.S. and is approved by State Departments of Highways. Weight of system is approximately 12 pounds. Call (412) 751-3055 for more information.